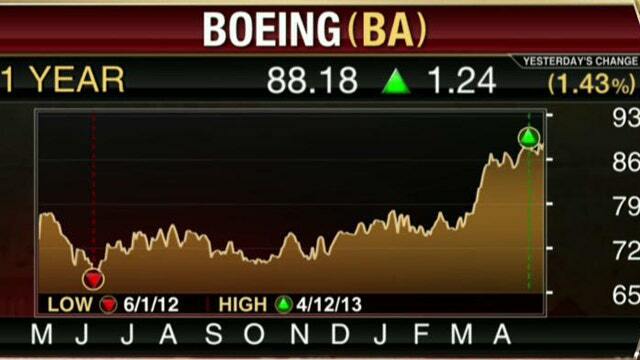 Earnings HQ: FBN’s Diane Macedo breaks down BA’s first-quarter earnings report. Boeing (NYSE:BA) overcame the battery troubles that plagued its 787 Dreamliner to post a 20% increase in its first-quarter profit, as the plane maker benefited from lower costs. The company topped Wall Street expectations and backed its 2013 financial and deliveries guidance, sending shares up 3.5% to $91.26 in early morning trading Wednesday. Boeing reported a $1.11 billion profit, or $1.44 a share, compared to $923 million, or $1.22 a share, in the year-earlier period that included a litigation-related benefit of 11 cents a share. The latest period included a tax benefit of 19 cents a share. Core operating earnings, which exclude items such as pension components related to market fluctuations, checked in at $1.73 a share, up from $1.40 a share and surpassing estimates of $1.49 a share. Revenue fell 2.5% to $18.89 billion, just beating the Street’s view of $18.8 billion. Boeing’s 787 jet was grounded by regulators earlier this year after a series of malfunctions related to the plane’s lithium-ion battery. A fix was recently approved by the Federal Aviation Administration, and airlines are working with Boeing to install the fixes and get Dreamliners back in the air. Chairman and Chief Executive Jim McNerney said during a conference call with analysts that battery fixes have begun on 19 Dreamliners, while the bulk of the fleet will be modified by mid-May. He added that 787 deliveries are expected to restart in early May. Meanwhile, the Chicago-based company’s defense business is cutting costs in the wake of reduced U.S. government spending. Overall operating margin was flat at 8.1%, while costs and expenses declined 2%. “Our first priority in the days ahead is to fully restore our customers’ 787 fleets to service and resume production deliveries,” McNerney said in a statement. For the full year, Boeing sees adjusted per-share earnings of $6.10 to $6.30 and commercial airplane deliveries of 635 to 645.